Forside » Kanaliseringer » St. Germain » Bravo! I am honored to work with you! Channeled by Genoveva Coyle. Greetings dearest ones! Greetings! I AM St. Germaine, I am your brother, your family, and friend, I AM the Holder of the Violet Flame and in charge of the I AM. I come today and every day to cheer you up and to celebrate with thee every step forward that you make. Yes, many of your steps are, in fact, backwards, for you are digging deep into your past, deep within your cellular memories. And while you are removing blockages. you are also finding priceless gems of wisdom. You are not looking for gold and gems, but believe me when I say to thee, you are about to uncover many precious pieces of your golden selves that are full of wisdom and power. It is the willingness to keep on going, it is the determination to never give up that makes us cherish and adore you more than anything! Many of you would have stopped and said to me and to the Mother, “I desire to sit where I am, I desire to send love and light, as much as I currently have and can hold. I wish to assist and help the Earth, my family and the rest of the human collective from the comfort of this current self. I am tired and I have had enough!” And we would not have said one more word to thee, we would honor your free will and choice to stop and rest, for we know how difficult a journey this is for all of you. But you are the strongest of the strong and said ‘no’ to leaving work unfinished, to mediocrity and to complacency. You want to keep on going, to honor your journey and your sacred purpose, till the end. Your devotion is astounding indeed, and your heart and soul direction is sharp and clear, focusing on the end result, focusing on the freedom, and on uncovering the magnificence of your dear self. Bravo and more bravo! I am honored to work with you! And so, do not hesitate to call on me for help in any matter, be that transmuting the lower energies, or healing your aching bodies, and filling you with energy and increasing your stamina, or as simple as getting financial assistance when in need! Remember that you are not to do all this work by yourselves, and we are always more than eager to assist and contribute to making your journey as easy and comfortable as it can be. 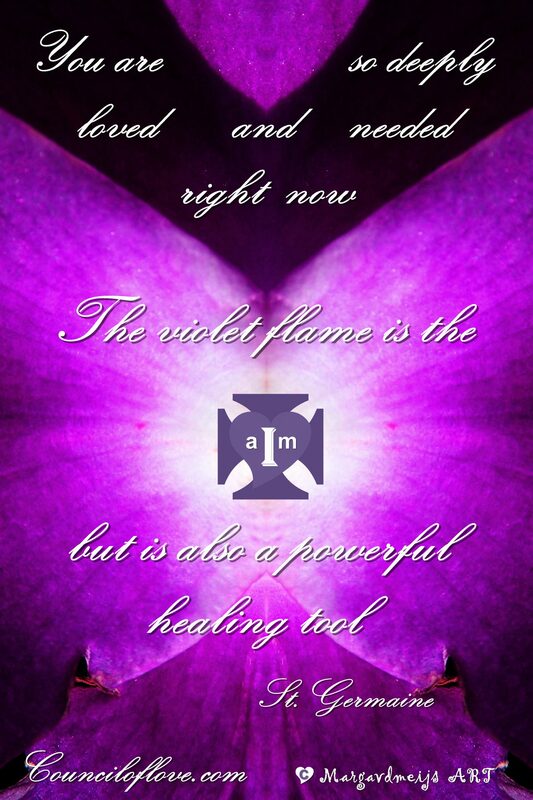 Take my Violet Flame with thee wherever you travel…in your reality or in your dream state. Let’s activate it so that it torches away, by default, without much effort, whenever you encounter any discordant energies, and let’s dissolve all these remnant old shackles of disempowerment for good! Let’s proceed in love and in fortitude! I am with thee, always! Farewell for now!